24-Hour Exterminator in Calgary | Cal-Rid Exterminators Inc. If anyone knows how to deal with pests, it’s Keith Petrie, Calgary’s “Bug Man.” Keith is owner and operator of Cal-Rid Exterminators Inc., providing effective solutions for insect, rodent, and bird infestations alongside his professional crew. 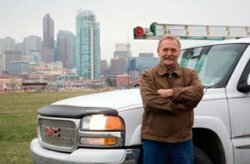 Keith is proud to be the exterminator Calgary has come to trust for fast, efficient, and permanent pest control solutions. Growing up in the pest control industry and inheriting his father’s company, Keith has kept abreast of new pest control developments in Calgary by staying current with industry advances, embracing new methods of pest control, and relying on the tried and true. Cal-Rid Exterminators Inc. has provided customers with affordable and effective pest management and pest control services since 1958. We are committed to employing ecologically friendly and humane control methods whenever possible in order to shield you, your family, home, and pets from harmful effects. We also understand that the pests that come into your home aren’t doing so maliciously and so try to use as many humane measures as possible in order to maintain a healthy respect for the animals we’re evicting and the environment that we all share. If you are bothered by any type of animal, avian, or insect pests, call the trusted, eco-friendly 24-hour exterminator in Calgary. We’re available day or night, 7 days a week to take care of all your pest issues.